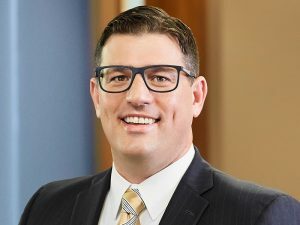 EDINA, MN – January 30, 2019 – Hellmuth & Johnson is pleased to announce that Nathan D. Prosser has joined the firm as a Partner in the class action and complex litigation group. His practice will focus primarily on antitrust and consumer class action, as well as general complex litigation. Prosser has extensive experience representing clients in complex commercial and class action litigation in both state and federal courts across the country. In addition to his extensive litigation experience representing individuals and business entities in litigation, he has substantial professional experience in the class action administrative services and been engaged on numerous electronic discovery consulting matters. In his antitrust and consumer legal work, Prosser represents large classes of individuals and corporations that are seeking to recover financial retribution caused by unfair market pricing activity. He has prosecuted national and global cartels on behalf of individuals and businesses injured by anticompetitive conduct in the marketplace, and he has successfully assisted plaintiffs and classes in recovering millions of dollars in damages for consumers. Prosser received his undergraduate degree from Concordia College in Moorhead, MN where he majored in Sociology, and earned his J.D. with distinction from the University of North Dakota School of Law. Hellmuth & Johnson, a Top 25 Minnesota law firm, represents clients ranging from individuals and emerging start-ups to multinational Fortune 500 companies. Focusing on transactional law, litigation and appeals, Hellmuth & Johnson attorneys are leaders in their fields. Founded in 1994, Hellmuth & Johnson has become one of Minnesota’s fastest growing law firms. Learn more at www.hjlawfirm.com.